Behind the Bookstore cafe is where the paintbrush never stops moving. Behind the Bookstore is an area of innovation. Coffee, pastries, wine and now painting, too. On Thursday evenings the Edgartown coffee shop is hosting an event dedicated to the fine art of creativity and cocktails. Paint Corner Art Bar originated in Cambridge but has crossed the Sound for the summer. Weather permitting Paint Corner Art Bar occurs every Thursday from 5:30 to 8 p.m. in the outdoor cafe area of the Behind the Bookstore cafe. The art classes are open to all ages and experience, and all materials are provided. Teacher Leslie Roberts-Belker gives each brush and stroke a unique nickname. For example, the largest brush is called Big Daddy, while a smaller one is Skinny Minny. Artists all work on the same image, however, everyone is encouraged to use as much creative license as they want to. At a recent class focusing on a lighthouse, some stretched the size of the image or changed the background from day to night. One artist even added whales and ships to the harbor. Ms. Roberts-Belker set only one rule for the class: no negative commentary. The punishment for breaking that rule on a recent visit was to dance to an entire Beyoncé song in front of the rest of the class. By the end of the two hours, almost everyone was pleasantly surprised with the result. “My friends and I are all amateurs, we walked into this class with very little talent and are walking out with a great finished product!” explained one artist. 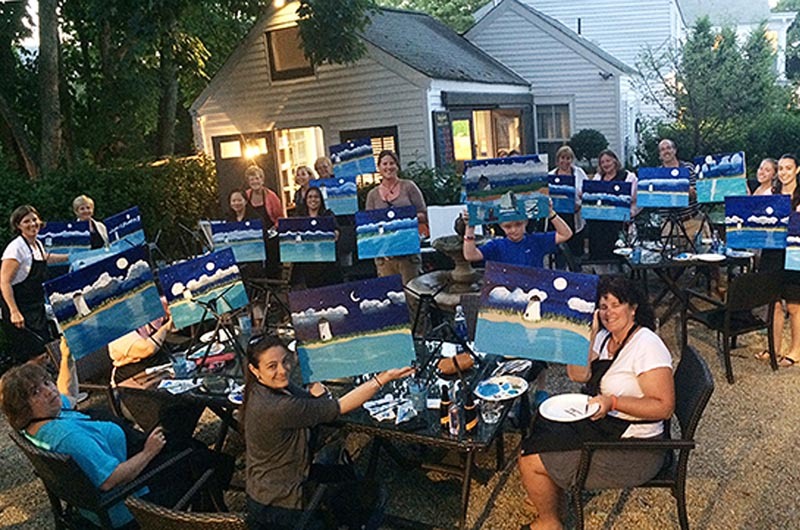 Visit paintcornerartbar.com to register for a class or host a private event.